You are currently browsing the Carpe DMM blog archives for May, 2010. I was just thinking when was the last time I got home from work and did nothing but slump on the lounge and watch TV all night. Or at least the equivalent – just relaxing and essentially doing nothing but passive activities. And I can’t recall the last time that happened. I’m always buzzing around, doing stuff. Making comics, or writing annotations, or composing puzzles, or tinkering away with code, or doing some 3D rendering – or writing blog posts. Occasionally I’ll do some housework or home maintenance stuff, or if I get really wacky I’ll start pulling out ingredients and make a batch of cookies or something. If I really don’t feel like doing any of those, and it comes down to the last resort, I go through my collection of unprocessed photos and play with them in Photoshop and post some to my Flickr page. I don’t just kick back and say, “What’s on TV?” I watch some TV, when I know there’s something on that I want to watch. But I never channel surf. I’ve always got half a dozen more interesting things to do. I’m beginning to think that for me, noodling around, playing with ideas, making things, doing creative activities – is relaxing. Sitting in front of a TV isn’t. A few weeks ago I went to a wine shop a couple of suburbs away for the first time. It was an Aladdin’s cave of delights, even to my raw and naive wine skills. It was where I bought my first Beaujolais. The shop is in an old bank building, and the vault is still in there, now filled with rare and expensive wines. One of the things I spotted in there in that first visit was a bottle of 1944 vintage port. At the time I had no idea if it would be any good, and it was $99 for the bottle, so I left it sitting there in the vault. When I got home, I did some searching and found that this particular brand was the premier Australian vintage port, and the 1944 vintage was supposed to be pretty good. People have drunk bottles form this vintage recently and been most impressed. 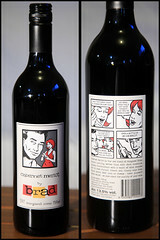 And everywhere else that offered a scant few bottles for sale were asking the order of $150 each. Today we went back for the first time, mainly to pick and choose a dozen bottles of wine to store away and work our way through slowly. 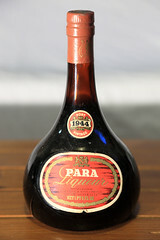 And the 1944 port was still there. So we made it an uneven 13 bottles. I’ve left the dust on it, to retain the character. The Seppelt family have been producing vintage ports in Australia since the 1880s. They actually used to have a “100-year vintage” program, where they stored part of each declared vintage (they don’t have a port vintage every year), to release them when they were 100 years old. They still do a 100-year tawny port release. Pretty amazing stuff. Anyway, I now have this astounding bottle of wine, more than 20 years older than me! I’ll probably try to drink it sooner rather than later – no sense missing out! But I’ll wait for a good occasion, and probably share it with some friends. Something to look forward to! We went to a new restaurant tonight. Qmin is an Indian restaurant, with a mid-range style. The menu was interesting, with a good mix of the classic Indian favourites you’d expect, plus some new and interesting house specialties that show the chef is applying a bit of creativity. We started with semolina-crusted eggplant circles, served with a coconut chutney, then moved on to a coconut lamb curry and some classic black dhal with rice and peshwari naan. We can’t go past a peshwari naan – the sweetness of the nuts and fruit in the bread is just too addictive. And this one was really good – possibly the best peshwari naan I’ve ever tasted, and I’ve had a lot of them. The eggplant entree was very nice, as was the dhal, though next time I go here I think I’ll try something other than the lamb again. One thing I noticed was the large window giving diners a view of the workings inside the kitchen. I’ve seen this before in other restaurants, and I just realised that it seems to be a feature of Indian restaurants in particular. I mentioned it to M., and she and I counted off a list of Indian places we’ve been to in the past. We realised that almost all of them have either a big window in the wall letting you see into the kitchen from your table, or in fact have the kitchen out in the open, again visible from the dining tables. We counted at least 6 other Indian restaurants we know that conform to this rule. I presume it must be a cultural thing about Indian food preparation. It’s interesting to realise something that you’ve sort of assimilated unconsciously and never really noticed fully before. This is the second of two half-bottles we got in a wine club dozen through my work. We had the first at a local seafood restaurant some weeks ago, and we went back there tonight armed with this one. 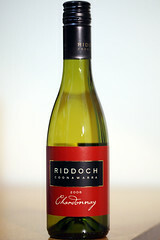 The first time I wasn’t too impressed – Chardonnay just seems too strong for me with its heavy oaky flavours. I tried hard to recognise anything else in this the first time,and failed. This time, however, some of its subtleties started to make an impression on me. 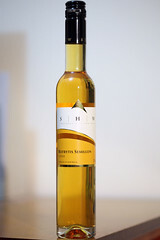 The back label claimed aromas of peaches and melons. Frankly, the first aroma that hit me was that typical oakiness. But after a few sniffs, I detected hints of rockmelon. I couldn’t get peach out of it though. So I was unimpressed the first time around, but this time I could appreciate some of the different flavours, and that made it more enjoyable. I had it with a meal of soft-shell crab, served with a spicy Asian sauce and some steamed green vegetables. All very nice. Some time ago a friend asked me if I would do the official photography for his wedding. It would be a joint effort with another friend of ours. We agreed. The wedding was on Saturday. I’ve taken a lot of photos at weddings, and done one other wedding as an “official” photographer (with the same friend who doubled with me on this recent one). Although I enjoy it, it’s hard work. I’m best at taking photos of landscapes or architecture. Things that don’t move, in other words. I use the time that gives me to tweak things and try out different angles and exposures and compositions, and to generally take my time lining things up. You don’t get that luxury with people. If you don’t capture the moment, it’s gone. Even if you do capture it, you can get it wrong by under-exposing, over-exposing, or getting the focus wrong. And, on the other side of the coin, there are many moments you do end up capturing that have people blinking, or looking goofy, or are generally unflattering. Taking portraits of people is not too bad in itself. If you have time to direct, compose, wait for them to look natural or laugh – rather than grinning stiffly into the camera – it works nicely. If you have time to look for interesting compositions and direct the subjects to stand here, move over there, look that way, etc. At a wedding, you don’t have a lot of that time. People are rushing about, trying to stick to a schedule that inevitably slips. They’re nervous, or thinking about other things, rather than relaxed and ready to be directed and sit still for several minutes at a time. Much of the time you just have to get in there and fire away with your camera. I’m sure you can get better at it. Plenty of people make a living out of shooting weddings. But you know, seeing some of those wonderful creative shots of happy couples or bridal parties in scenic surroundings and dynamically posed makes me realise just how much time and effort and thought must have gone into those shots. You can’t just take a bride and groom into a garden for half an hour and get a drop-dead gorgeous photo. You need to plan it, and you need to direct the subjects. You need to stop time for them and have the luxury of an hour or two where there’s no rush to be somewhere else or worries about what’s next on the schedule. Sometimes I think the best wedding photography isn’t done on the wedding day at all. It’s just too hectic. It has to be staged as a photo shoot, without all that other stuff happening around it. 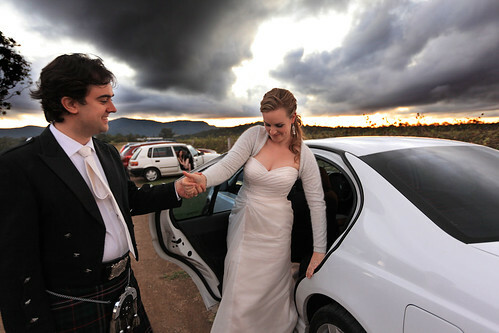 To really do a wedding justice in photographs, I wish I had more time. Oh, I’m pretty happy with some of the shots I got this time. There are just some where I wish I’d had a bit more time to adjust things to get the shot perfect. This is not to complain. The day is for the happy couple, after all, and forcing them to bow to the whims of a photographer is not conducive to stress minimisation.